Plan your SUP Guided Tour……take a leisure cruise, or visit the sites. Paddle the Historic Kingston Roundout, up close to the Rhinecliff Bridge, or the Kingston Lighthouse. SUP to Mills Mansion, have lunch on a sandbar, or paddle a channel to see waterfalls! Enjoy a sunset cruise on the calm water, or ask about our dinner paddle. Get out there and LEARN TO STANDUP PADDLEBOARD ! Our Group Lessons are a fun way to spend your day in the water learning the basics of stand up paddle boarding. Group Lessons have a maximum student to instructor ratio of 4 to 1. Private Lessons can be tailored to any ability level from beginner to more advanced standup ability levels. Maximum student to coach ratio of 2 to 1 insures excellent service and attention, as well as maximum safety and progression. Go for the best part of a paddle. Start at one of our put-ins and one of our Guides will take you on a one to four hr (which ever is your choosing) down wind paddle. The paddle will cover the most distance possible in the allotted time with the paddle getting to see the sights of the beautiful Hudson Valley. All done with out the need of paddling against the wind and tide to get home. We will then pick you up at the take out and bring you back to the start. Nearest station by subway: Blue Line at 42nd St. Port Authority or Red Line at Times Square/42nd St.
MKC – Manhattan Kayak Company is located at the Pier 84 boathouse, West of 12th Ave. and 44th St., just across from The Intrepid Sea, Air & Space Museum. For just $5 per person for a half-hour, you can play on the water in MKC’s “Lake Intrepid”, the protected embayment off of our dock with the impressive USS Intrepid Sea, Air & Space museum as a backdrop. All rentals include a life jacket (required), paddle and one of our super fun sit-on-top kayaks. Each session is limited to 6 single sit-on-tops and 2 double sit-on-tops (check the rental calendar for availability), so we recommend booking and paying ahead. If you are more spontaneous, you can just drop in and see what is available. If you wish to venture further afield, you will need to look into one of our guided tours, but rentals are an economic, fun way to get your feet wet! For just $15 per person for a half hour, you can play on the water in MKC’s “Lake Intrepid”, the protected embayment off of our dock with the impressive USS Intrepid Sea, Air & Space Museum as a backdrop. We have some super stable beginner stand up paddleboards for you to try, and the rentals include a paddle and a lifejacket (required). If you wish to venture further afield, you will need to look into one of our guided tours, but rentals are an economic, fun way to get your feet wet! Once you have experienced the joy of SUP, you will want to keep coming back, we offer complete instruction with our professionally accredited staff, and you may want to inquire with our desk staff about our “5 for $55 SUP Rental” package to practice your new found skills, and get you ready to explore the exciting challenges of our local waters and sights. 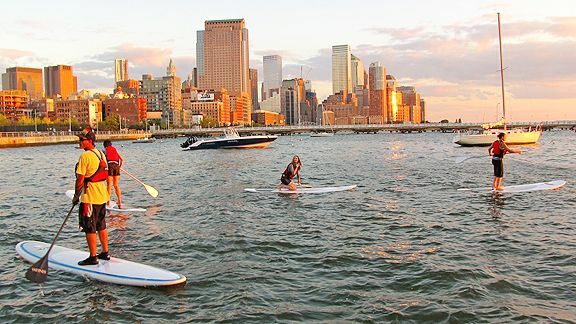 Courtesy of Lisa Altobelli An Urban Escapes class teaches paddleboarding on the Hudson River in New York City. On a recent New York City evening, a class of 15 twentysomethings bobbed on a makeshift dock in the Hudson River listening to an instructor tell them about the country's fastest-growing watersport, paddleboarding. As they strapped on life vests, they heard about the precautions -- watch out for boats and bodies of course, plus other useful advice like, "Close your mouth if you take a tumble because the last thing you want is to swish this river water between your teeth." This turned out to be much-needed guidance as three-quarters of the newbies took a dive soon after they shakily wobbled up from their knees, albeit the women fared better than the men. "The girls always do better because they have a lower center of gravity which means better balance," said Brittany Wright, a guide for Urban Escapes who suggested the sport to her company after spotting it on a recent Hawaiian vacation. It seems easy enough. You stand on a 12-to-19-foot-long board, grab at least a six-foot-long paddle and set off into the sunset. What's deceiving is the amount of core strength it takes to stay upright on the bobbing board and how downright exhausting the paddling can be -- so much so that even professional athletes have incorporated it into their workout routines. The NHL's former ironman, Chris Chelios, would routinely paddle 20 miles up the Malibu coastline during his past six off-seasons with his big-wave-riding neighbor Laird Hamilton. And while paddleboarding's roots can be traced back to ancient Polynesia, Hamilton can be credited with popularizing the sport in recent years after he paddled across the English Channel in 2006, put his name on a signature line of stand up paddleboards and has said that it renewed his excitement for surfing because, "It brought me back to a place where I can be happy again on a one-foot wave." This year there are professional paddleboarding races almost every month from Hawaii to Florida, while diehards like 48-year-old old endurance athlete, Tom Jones, took 92 days to paddle the 1,500 miles from Key West to New York City this summer -- a mind-boggling feat to those in the Urban Escapes class who found it tough to get their bearings on their first go-round in the choppy Hudson. "I was one of the lucky ones since I didn't fall in," said Urban Escapes founder Maia Josebachvili, who also has branches of her company in Boston, Philadelphia and Washington D.C., and offers a multitude of other adventure sports like skydiving and white water rafting. The company is always mindful of the safety of its clients of course. "We hire the best instructors we can find so everyone feels comfortable trying out these sports, but let's just say we have a robust insurance policy," Josebachvili said. Join us for our first summer of Stand Up Paddle Board (SUP) instruction and tours. Standup paddleboarding is the fastest growing watersport in the world for a good reason: it's fun! Whether you're looking for a great cross-trainer to supplement any sport or it's your first introduction to paddling on the Hudson, SUP has something for everybody. Our beginner classes focus on the fundamentals - where and how to stand, the basic propulsion and maneuvering strokes, basic navigation skills, and how to get back on the board if you fall off! Intermediate classes and tours focus on skill refinement, efficiency, and building stamina. Our most popular SUP offering is our Try SUP introductory class: for only $25 on Wednesdays from 6 to 8PM, 3 or 4 students are assigned to a board and they take turns. This has proven to be a great way to get started, because taking breaks gives you a chance to rest and think about your experience, so the sensation of being on a board becomes familiar quickly without being to tiring. It's fun to talk with other members in your group between turns. We offer more formal classes in our beginner classes - each student is assigned a board for the whole 2 hours. Our high staff to student ratio assures plenty of individual attention: Tuesday evenings 6-8pm as well as Saturday mornings 9:30am-11:30am and 12:30pm-2:30pm. We offer intermediate classes in tour form, where we take a little trip on the Hudson and work on refining all aspects of SUP technique. All of our instructional classes and tours are based on a rate of $50 per hour. We offer a 20% discount to individual participants who pay in advance for 5 classes. We also have a SUP club, where you can store your board with us - we offer a selection of boards tuned to the metro waterways - or you can use our boards for a very modest practice fee.